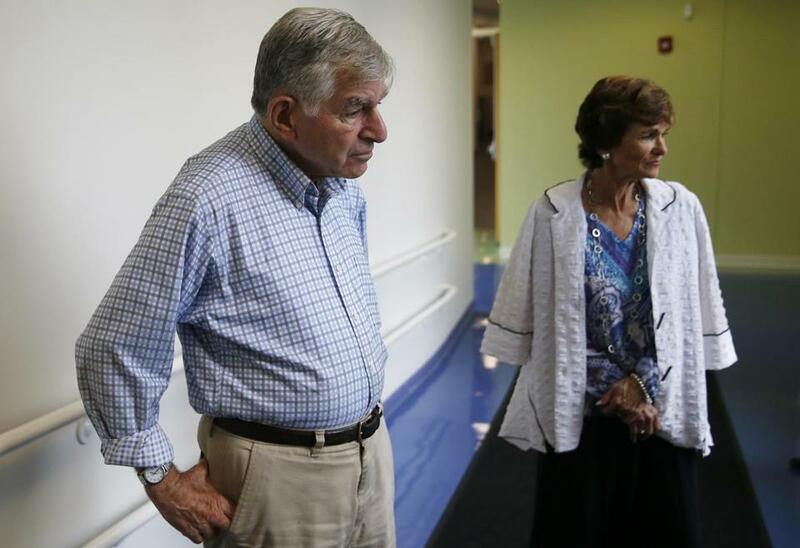 Former Massachusetts governor Michael Dukakis and his wife, Kitty, toured the New England Center for Children. SOUTHBOROUGH — It happened a lifetime ago, in the days when few people knew who Michael Dukakis was, and still fewer could imagine the life that spread out before him — the governorships, the bid for the White House, the career today as an academic eminence grise. But what he saw that day 50 years ago at the Walter E. Fernald State School in Waltham, where people with developmental disabilities were dismissed by their doctors and warehoused by a society content to keep them out of sight, has never left him. Its tectonic impact is visible as he sits in the corner of a conference room here at the New England Center for Children. His familiar strong-and-firm voice grows thin. He speaks haltingly. His eyes fill with tears. He’s clearly choked with emotion by the memory of it all. What then-state Representative Dukakis saw in the adult wards later that day was similarly appalling, its visceral impact still apparent. He said he was still rattled when he returned home to his wife that day in 1965. Dukakis was elected governor in 1974. A year later, a small group led by Vincent Strully Jr. started the New England Center for Children at Taunton State Hospital — where similar, medieval conditions existed — with a $30,000 grant from the state. The fruit of that seed money is apparent at the bright and polished center that sits along a stretch of Route 9 here, where the lives of children from 18 months to 22 years of age are transformed through education, research, and technology. Walk through the place with Michael and Kitty Dukakis and it’s difficult to imagine that those dark days at Fernald — in the span of history just an eye-blink ago — festered just 23 miles away in Waltham. Instead, speech and language pathologists tailor special programs to meet individual needs. Motor skills are honed at the Michael S. Dukakis Aquatic Center. Web-based lesson plans guide teachers of 4,600 students from around the world. 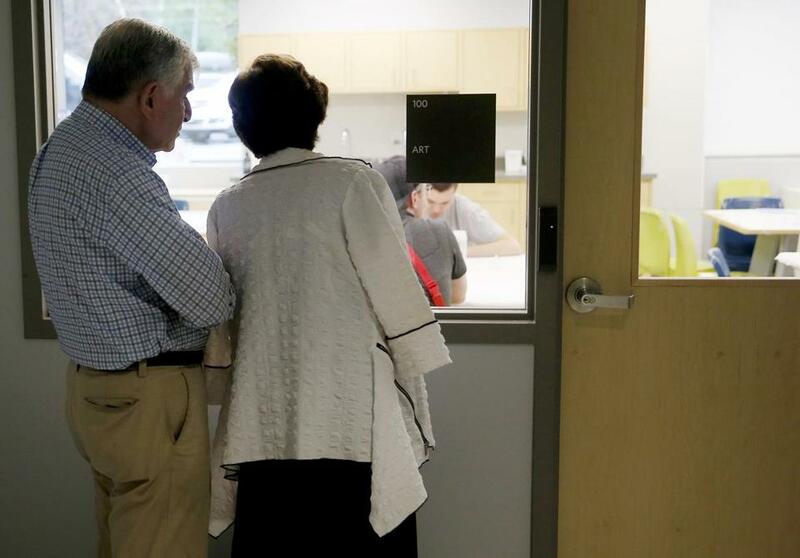 Michael Dukakis and his wife, Kitty, peered into a classroom as they toured the New England Center for Children. Instead, a young boy named Luke is sitting at the computer, wearing cool headphones and watching a computerized version of the beloved story of Thomas the Tank Engine, the tale of a fictional steam locomotive. Dukakis is a member of the school’s board of directors, one of seven boards on which he serves. He teaches public policy at UCLA in the wintertime and spends the rest of the year at Northeastern, where he is a distinguished professor of political science. Dukakis is able to teach his students about the hard work, the nuts and bolts, and the political minefields that accompany the confrontation of expensive and nettlesome social issues. And he knows about the euphoria and searing personal pain that come with electoral wins and losses. So he doesn’t need to read Hillary Clinton’s memoir to know how she felt when the White House slipped away from her last November. “Bad. Bad,’’ he said, describing how he felt after his 1988 loss to the first President Bush. “First, you’ve disappointed literally thousands of people who worked for you. I made two very big mistakes in that campaign. It took Barack Obama’s historic 2008 campaign to validate the premium Dukakis always placed on precinct-by-precinct political warfare. That’s how Obama won, Dukakis tells his students. But these days, they have another question for him: How in the world did a man like Donald Trump become the most powerful man in the free world? Dukakis said he wants his students to examine Trump’s campaign, to conduct a postmortem analysis of why so many Americans supported him. Dukakis is a member of the school’s board of directors, one of seven boards on which he serves. Time heals. Mostly. But defeat still stings. Dukakis turns 84 in November. When he’s not teaching in Southern California, he walks 2 miles to the Northeastern campus and 2 miles back home each day. I ask him how long he intends to keep doing it, this classroom work that likely will be the last professional chapter in his long career of public service. “Until somebody taps me on the shoulder and tells me that I’ve lost it,’’ he said. Until then, he’s still working on his legacy. That legacy lives in the students whose papers he’s correcting, whose minds he’s shaping. And it’s in places like this in Southborough, where the footprints he’s left can be traced back to that awful tableau at Fernald, once the nation’s oldest institution for people with developmental disabilities. It was closed in 2014 and sold to the city of Waltham. That scene — that smell, that horror — was a defining moment in which a young man faced the unspeakable and resolved to do something about it. 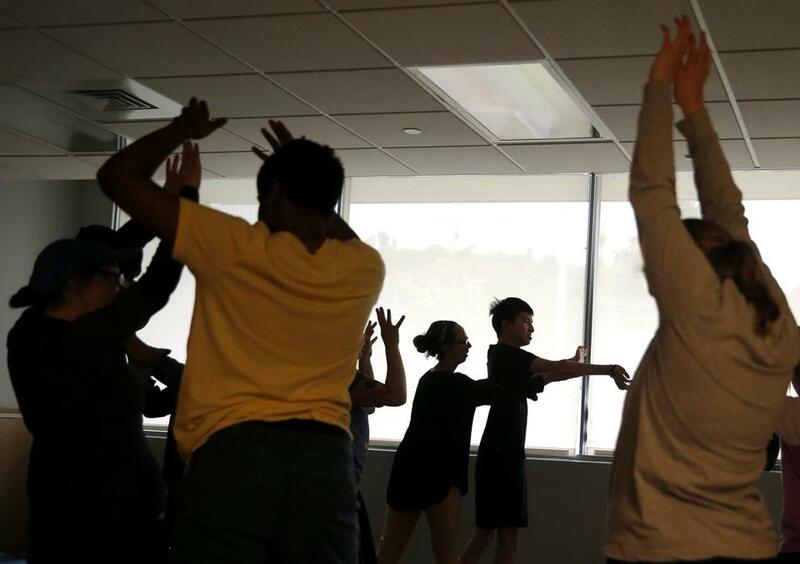 Students practiced yoga at the New England Center for Children.